It’s time again for Book Review Monday and another Giveaway!! I love to read! If you know me, you already know this to be true. If you don’t, well, one of my favorite things to do is read. I love it, but I don’t always feel like I have the time to do so. Being a pastor, an author, and a speaker, one of the questions I always get from people is, “What are you reading?” I suppose it’s because they want to know what I would recommend, what inspires me, or what I’m feeding on. I was very excited when the Hachette Book Group gave me an opportunity to review and giveaway a copy of Touching Heaven – A Cardiologist’s Encounter with Death and Living Proof of an Afterlife , which was just released on September 15, 2015!! Dr. Chauncey Crandall knows his patients well. When they are dying, he sits at the bedside with them and holds their hands. He prays with them. Sometimes he can feel what they feel and see what they see. At other times his patients have near-death experiences and “come back” with astonishing descriptions of the afterlife. 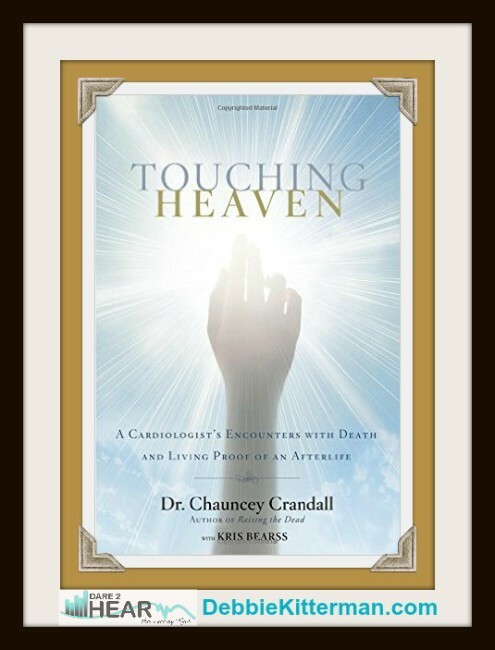 In Touching Heaven, Dr. Crandall reveals how what he has seen and heard has convinced him that God is real, that we are created for a divine purpose, that death is not the end, that we will see our departed loved ones again, and that we are closer to the next world than we think. When I first began reading Touching Heaven, I was immediately drawn in by Dr. Crandall’s testimonies of patient and his real life journey with his son through cancer. Who could be more credible than a doctor who works daily with people who have life threatening illness and diseases? Who better to share firsthand what heaven can do when you pray and believe? Who better than a father to share with us the realities of sitting at his son’s deathbed and making the life-changing decision to run to God – even in the midst of staggering grief. I can’t think of anything better than Dr. Crandall’s book to increase your faith and inspire you to pray for the sick believing for them to recover! Dr. Crandall’s journey is touching and inspiring. When his young son was diagnosed with cancer, ‘he went running after God, earnestly pursing Him’. He had to decide if there was more to life than the earthly existence. He had to decide if there is a heavenly realm and existence beyond this one, and if there was, then what would it mean for his time on earth if there was. “It’s a decision we all make. The answer changed how I practice medicine and it would change me. Touching Heaven has inspired me and challenged me to more actively pursue bringing the Kingdom of God to earth and walk out what Jesus said we should be doing today. If you want your faith to be increased… if you are interested in participating in and seeing healings… If you are interested in advancing the Kingdom of God here on the earth, or, if you are interested in near death experiences, and what happens after we die, you simply must read Touching Heaven. I just LOVE gifts, and I love free stuff too. So, as promised, one blessed person will win their very own copy of the book Touching Heaven. Keep it for yourself or give it as a gift to someone else – Christmas is only 8 weekends away!!! A HUGE Thank You to Hachette Book Group who has generously offered a FREE copy of the book to one of my readers. To enter utilize the Raffle-Copter below. Also for an extra entry leave a comment on this post. I will announce the winner in two weeks on November 9th You can enter every day, so make sure to do so, and come back and see if you won. Please help me spread the word and share this review with your friends on Facebook, Twitter and any other social media you utilize. You just might change a life! Always appreciate the recommendation for another good book. Thanks for posting a review!! Thanks for sharing. Sounds like a great book. Thanks for linking up at Literacy Musing Mondays. I’ll share your giveaway on my own blog, too. Congratulation Sarah – you won the copy of Touching Heaven – thanks for posting a comment and tweeting about the giveaway. I have emailed you privately as well. What a great review of this book. You shared some very interesting portions which really make me want to read it. Many blessings to you!